Various people have asked, over the years, for a way to retrieve back issues of King Midget newsletters, particularly the tech articles. It’s a complex challenge. When King Midgets West Chapter buddy Randy Chesnutt offered to help organize the information, a project was launched and this new book is the result. The original manual was a compilation of some 200 articles from past newsletters and other publications specific to the maintenance and restoration of King Midgets. All stuff published here and there over the past decades. There were 14 sections, 375 pages, with some notes added for updates and clarification and a reasonable amount of cross indexing.That was a couple of years ago. 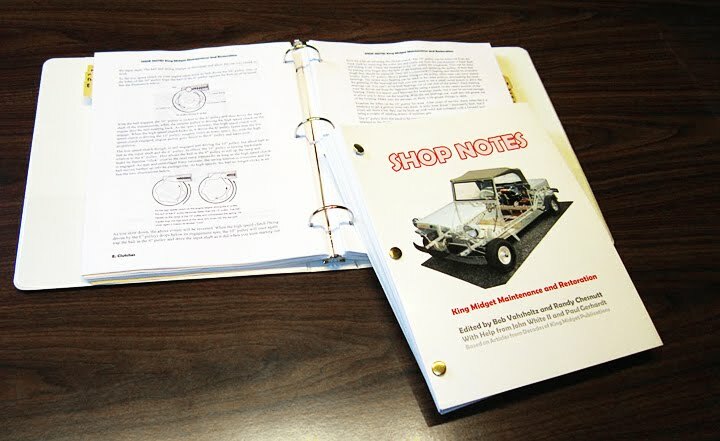 Now the first edition is sold out, and new edition is available that includes all the articles written since then, plus a full copy of the 1968 King Midget manual--the most complete service and maintenance manual the company ever published. It is added as a separate section, and cross indexed in the Table of Contents/Index. Organizing this manual proved quite a challenge because nearly all articles were created without considering similar topics written before or after. And yet we decided to leave them all as written (except for larger type and illustrations) rather than trying to interpret and update them. Who are we to judge? There are many ways to skin a cat …and fix a Midget. We leave it to each reader to sort through what’s been written and choose their own path toward enjoying their King Midget. As Randy and I reviewed this wealth of KM tech bits, we saw the need for many future tech articles. Readers of King Midget News continue to send in new and better tech information as it develops over the years. We plan to continue publishing updated editions every so often, but for those who have older copies, all the newer articles (including the 1968 Manual) and new articles as they are written can download them free download from this website (See SHOP NOTES The Updates). They're formatted as PDF files consistent with the book. Anyone can print and punch those articles and add them to their manual, in the proper section, anytime they choose—such as when the grandkids come to visit and can help Grandpa with the project. Those who bought copies when the book first came out already have the second edition if they've continued their updates. We think the manual works best if placed in a 1 1/2 inch ring-binder (or thicker!) so it will stay open to the proper page for your project without laying a greasy hammer across the book. That’s why the manual is printed loose-leaf and three-hole punched. We don’t furnish the binder. You can buy ’em as cheap as we can, and if we furnish them, both the price of the book and shipping cost would go up. Also, you may find it convenient to insert alphabetical separators between sections or mark them with yellow stickers. The important thing is to be able to easily update your manual as new information comes along. Our job is to rounding up the information, sorting it into the proper format, making it available, and devising a way to keep it coming. As with other publications by King Midgets West, profits go to projects aimed at enriching the Midget Motors heritage. Second Edition Published 2017, 455 pages, $42, plus shipping and handling. Get your order in now!The illustration shows the manual as you can set it up in a three ring binder or you can leave it simply bound with removable posts, the way it ships. NOTE: This book is sold out on this site, but readily available from Olde Milford Press. Updates come out about three times per year and continue to be available from this King Midgets West website. Your copy need never be out of date.